Georgette and Jess Sanchez, parents of missing Los Gatos woman Jeanine Sanchez Harms, sit at their kitchen table. Forty-two years ago, Jess and Georgette Sanchez moved into a modest house in Campbell, hoping to raise their children in a quiet neighborhood. The house is painted a bright powder blue, with red shutters and a tire swing out front for the grandkids. Georgette planted Rose of Sharons and bougainvilleas near the entrance, and they've grown into large bushes that dominate the front yard. Here, their daughter Jeanine held countless slumber parties as a child, and on these streets near Castro Middle School, she rode her bicycle and took home stray animals. The house, Jess says, was to be left to Jeanine and her brother, Wayne, so that Jeanine would never have to worry about buying her own home. But all that's changed since Jeanine, 42, vanished from her Los Gatos home more than two months ago. Now, the Sanchezes don't know how to plan for the future, since they don't even know what happened to their daughter. They've continued to pay her bills, including the one for her cell phone--which disappeared along with Jeanine on July 27--in case someone uses it and provides a clue to Jeanine's whereabouts. After the disappearance of her daughter, Georgette Sanchez says that she is just beginning to resume normal activities, but still alternates between good days and bad days. "We still have some hope that maybe she's being held someplace," Georgette says. "As long as the police don't tell us differently, she might be alive someplace," Jess adds. The Sanchezes, however, increasingly refer to Jeanine in the past tense. Georgette says she dislikes large groups and avoids being the center of attention. After Jeanine disappeared, their oldest son, Craig, the official family spokesman, protected them from the media spotlight. Attempts by me, a newspaper reporter, and other members of the press to speak with Jess and Georgette were politely refused. Craig, however, had to go back to his home in Maryland at the end of August, and now Jess and Georgette are making themselves slightly more accessible--including the occasional interview and appearance at some events in Jeanine's honor. They want to keep the case and Jeanine in people's minds, they say. I met Jess and Georgette at a Sept. 6 press conference, one of their rare public appearances, and managed to get a brief interview with them, along with two other journalists, after the conference. I requested to meet with Jess and Georgette the following week, and they consented. Their home had been off-limits to the press (an August interview with America's Most Wanted was held at someone else's house), and I expected to meet them at a restaurant or other neutral ground. But Jess said, "Why don't you come to the house?" Jeanine Sanchez Harms' parents could be anyone's next door neighbors. 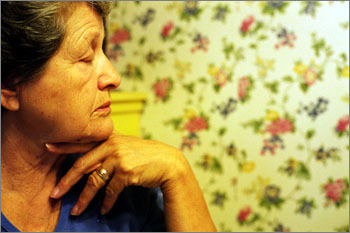 Jess, 75, is of Mexican descent, dark-skinned, with a shock of white hair. He is close to 5 feet, 9 inches tall and wears bifocals. Georgette, 76, has a fair complexion--she is half-French and half-Mexican--and is usually soft-spoken. Both are retired educators. Jess was a Spanish teacher at Del Mar High School in San Jose when it first opened, and retired as the principal of Los Altos High School in 1985. 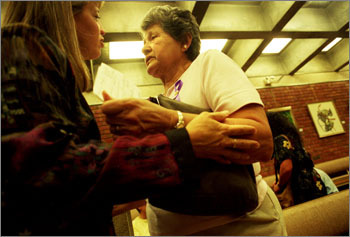 Georgette taught English as a second language and bilingual classes until 1985 at Cesar Chavez Elementary in San Jose. They have been married 52 years, and she still calls him "hon." Jess collects videos and audiotapes. In the family room, meticulously labeled movies--everything from the classic "Breakfast at Tiffany's" to action-adventure blockbusters such as "Independence Day"--sit on the shelves that line one wall. 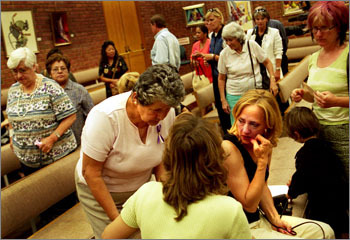 At a Sept. 6 press conference in the Los Gatos Town Council Chambers, Georgette Sanchez speaks with her daughter's friends, Chigiy Binell (right) and Janice Burnham (back turned). Georgette loves to garden, as evidenced by the blooms in front and in back of the house. She's let it slide in the past two months, but is just starting to weed and prune and dig once again. "Each day we do a little more things ... I just want to be outside because we've been inside so long," she tells me and then launches into a discussion on the history of the Rose of Sharon. Family photos adorn the walls of the Sanchez home--the grandchildren as babies; Georgette as a young woman; the five of them in the '70s, with one of the sons dressed like a hippie; Jeanine as a bride in 1995. Her marriage to Randy Harms would end almost five years later. Adjoining the family room is a sunroom that doubles as a playroom for the grandchildren whenever they visit. Georgette keeps a bin in there that contains all the newspaper articles written about Jeanine in the past two months, as well as the letters of sympathy that they have received. The first day that I visit Jess and Georgette, we sit around the kitchen table to talk. In the middle of the table, there's a purple pillar candle that Georgette lights every morning and blows out every night. The candle is Jeanine's favorite color, and it came from an Aug. 26 prayer service for her at St. Thomas of Canterbury Church in San Jose. Life has been difficult and even frustrating at times since Jeanine was reported missing on July 30. At first, the family tried to talk to people in Los Gatos and Campbell--people who worked at the restaurants and bars that Jeanine frequented--to see if they had seen Jeanine after July 27. Police eventually asked them to stop so that they could proceed with their investigation. "There's nothing we can do right now but wait," Jess says. "Just be patient." Georgette says it's hard being patient. "I want to run up and down the street and look in the houses and see what's there," she says. They say they hope that each phone call they receive brings some news, but at the same time, they're reluctant to hear what might prove to be bad news. When they realized that Jeanine was missing, "we thought it was a mistake," Georgette says. "We're not stupid, but we're a very hopeful kind." The Sanchezes say they never thought something like this could happen to them. "We always expect everything to be all right," Georgette says. Initially, the family experienced shock and disbelief, but now Jess says "it's just a matter of adjusting to the fact that she's not here." Both keep their composure during the interview. It's still hard, however, for them to see the posted fliers with Jeanine's photograph and to attend events on her behalf. "That's our daughter," Jess says. "It's just painful." I ask Georgette if she ever thinks that Jeanine is still around, and she says yes, that she occasionally has dreams about Jeanine. In one of those dreams, all the family is gathered and Georgette receives a phone call from Jeanine. "She said, 'Mom,' and I looked up and I was going to yell at everybody, and then I woke up," Georgette says. "It was her voice." "We wake up and say, 'Is this real, is this happening?'" Jess says. "Some days I feel strong; some days I crumble at anything," Georgette says. A good day, Georgette says, is "when the family comes over and we talk about things that make me forget [about the case]." Jess has eight surviving siblings, most of whom stop by the house every day. Or, Georgette says, it's when "the girls"--Jeanine's closest friends Chigiy Binell and Janice Burnham--visit, and they all go into the garden and talk. A bad day for Georgette is one that begins with something that upsets her and she can't shake the mood. The Sanchezes are a close-knit family. Craig moved to Maryland with his wife and two sons about a year ago but flies back every six to eight weeks for business and to see his parents. Wayne, a divorced father of two, lives with Georgette and Jess. I ask Georgette if there's a role that each person in the family plays. She says that Craig, who was the family spokesman for the case when it first broke, is the leader. "We depend on him a lot," Georgette says. Wayne is the cook and barbecuer, and Jeanine was the social organizer, the one who planned the holidays and family events. "And me, I guess I'm the follower," Georgette says. Every other weekend, Jess and Georgette pick up Wayne's two daughters, ages 9 and 11. Jess and Georgette recently resumed these visits after a brief hiatus while they were trying to cope with their daughter's disappearance. During the visits, they don't talk about Jeanine. The girls "adored her," Georgette says, and know what happened, but act as if everything is normal. The granddaughters sleep in Jeanine's old room when they're over. When Jess and Georgette show me the room--still pink, as Jeanine had decorated it when she was a teenager--there's a cat sleeping on the bed. His name is Willy, and he is extremely affectionate. The other three cats, Corn Nuts, Smokey and Spooky, remain outside. All four were adopted by Jeanine and given to her parents when she moved to places that didn't accept pets. Jeanine gave money to different animal causes and sponsored a child from a poor country. "She was an extremely compassionate person," Jess says. One day I call the Sanchezes to see how they're doing. Georgette tells me that it's her birthday, but she doesn't much feel like celebrating. She's not planning to go out to dinner because it's Jeanine who usually makes the reservations and comes up with the ideas. "I don't think we'll ever have happy times again," Georgette says, beginning to sob. "I'm sorry, I have to go," she says and gently hangs up the phone. 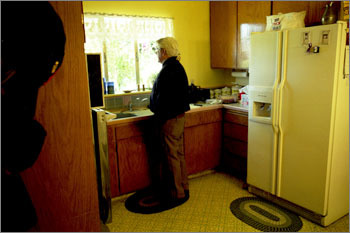 Jess Sanchez stares out the kitchen window of the house that Jeanine Sanchez Harms grew up in. Later on in the day, I stop by the house with roses for Georgette. She greets me at the door with a hug. Inside, Wayne and Jess are sitting on the couch and watching TV news reports about the terrorist attacks on the World Trade Center and the Pentagon that had happened earlier that day. Janice and Chigiy are also there, and they help Georgette with arranging the many bouquets of flowers that she has received. That night, there is no mention of Jeanine, except when Wayne asks me who I am. "I'm a reporter with the Los Gatos Weekly-Times," I reply. "Oh," he says. "I thought you worked with my sister." Lucy Sanchez Crumpton, Jess's sister and a Los Gatos resident, also drops by to give Georgette a birthday gift. As we leave, she tells me that it's hard on Jess and Georgette, but they are holding up remarkably well. Chigiy has known Jeanine since they were children. "Life is just going to go on, but it's going to be a sadder and lonelier place," she says. "There's just a void and a hole ... and you can't move on from that stop." Chigiy owns the duplex on Chirco Drive that Jeanine moved into in April. When I talk to Chigiy, she is gardening in the back yard of the duplex. She says she usually doesn't refer to Jeanine in the past tense. "I don't even do that with my mom, and I know that she's dead," Chigiy says. "I don't want to be complacent. I want to find out who did this. I want to bring him to justice," Chigiy says. "I want him to know that I'm never going to rest until he's behind bars. I hope he never sleeps because of this. I hope he's tortured by this." Janice, who met Jeanine when they were students at Prospect High School, says that the recent tragedies on the East Coast bring up new emotions. "After what happened," Janice says, "I just hope that this hasn't become unimportant in people's minds." At the same time, Janice grieves for all the people on television who are missing a loved one in one of the collapsed towers. "It's so upsetting because I can so much relate to what the people are feeling." Like Georgette, Janice has dreams about Jeanine. One night, she thought that Jeanine had come back. "She said to me, 'I've just been with one of my ex-boyfriends for a few weeks. I just needed to get away.' And I was so mad at her," Janice says. "We just need to find out who's responsible and convict them," Janice says. "Someone needs to be held responsible." In July, Craig and his family visited Jess and Georgette. On Tuesday, July 24, they all went to Original Joe's in San Jose for dinner. There, the family made plans to hold a barbecue for Craig the following Sunday. 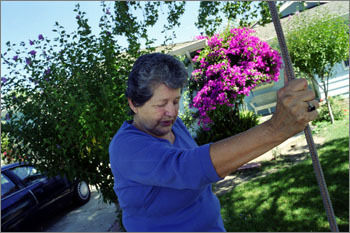 Georgette Sanchez holds onto a tire swing as she walks around the front yard of her Campbell home. On the way back from the restaurant, Jeanine told her parents about an upcoming date on Friday. She was planning to meet a man named Alex at the Pruneyard in Campbell. 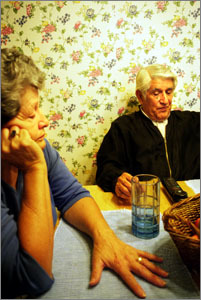 "She didn't want to, but he was insistent," Georgette recalls. Jeanine never contacted her parents after Friday. Georgette called her twice, wondering when she was planning to come to the barbecue. Janice also called her several times to ask her how the date went. But Jeanine never called back, and she never showed up. Alex--William Alex Wilson III--was one of the last people to see Jeanine. According to police reports, he met Jeanine at the Rock Bottom Restaurant & Brewery in Campbell on the night of July 27. Sometime during the night they went their separate ways, and Jeanine ended up with San Jose resident Maurice Nasmeh. The two eventually went to Jeanine's house. Nasmeh, who has since stopped cooperating with the investigation, reportedly told police that when he left Jeanine, she was sleeping on her couch. Later, police discovered that Wilson was from the Santa Clara family that founded Wilson's Jewel Bakery. His father, William Wilson, had been mayor of Santa Clara for several years. "I do remember this," Georgette says. "Someone said, 'Oh my, he's from an extremely well-established family.'" 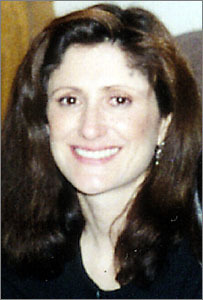 Jess and Georgette didn't learn of Nasmeh's identity until they saw the police-issued flier with his name and photograph, along with a picture of Jeanine. The Sanchezes say that they wonder why Nasmeh's photograph was released, but Wilson's was not. Georgette did not expect to see Nasmeh's face side-by-side with Jeanine's. "It's a horrific flier. It just shocked me," Georgette says. I contacted Wilson at the bakery. "I have been unfairly tried and prosecuted by the press," he says. "I have no comment." Kim Petersen (left), executive director of the Carole Sund/Carrington Memorial Reward Foundation, speaks with Georgette Sanchez on Sept. 6, after Petersen announced that the foundation would contribute $5,000 to Jeanine Sanchez Harms' reward fund. My attempts to reach Nasmeh were unsuccessful. When I ask Jess what he would say to the person who is responsible for Jeanine's disappearance, his response is different from that of Chigiy and Janice. "I don't care about him," he says fiercely. "The only thing I care about is getting Jeanine back. I don't give a damn about him."